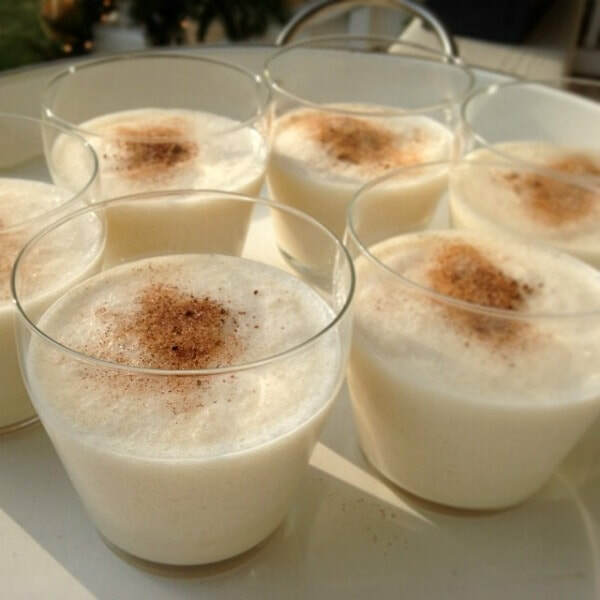 This homemade (non-alcoholic) eggnog is a healthier version of the typically high-fat winter drink. Make it for the holidays, or simply enjoy it for a chilly weather treat! Add 1 ½ cups milk, vanilla extract and the citrus zest (if using) to a medium saucepan and heat through. Meanwhile, whisk the eggs, egg yolk, sugar and cornstarch in a medium bowl until light yellow. Gradually pour the hot milk mixture into the egg mixture, whisking constantly, then pour back into the pan. Place over medium heat and stir constantly with a wooden spoon in a figure 8 motion until the eggnog begins to thicken, about 8 minutes. Remove from the heat and immediately stir in the remaining ½ cup milk to stop the cooking. Transfer the eggnog to a large bowl and place over a larger bowl of ice to cool, then chill until ready to serve. *Nutrition information includes skim milk in analysis.